Alexa Chung monogram jacquard skirt. For in-store inquiries, use sku #2428630. 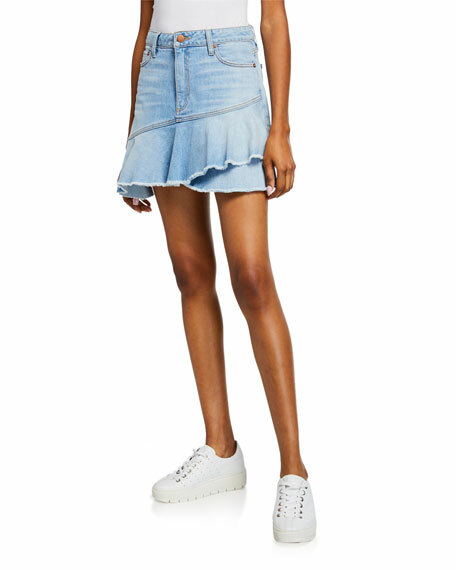 Alice + Olivia "Good" denim skirt. High-rise; belt loops. Five-pocket style. Straight silhouette. Mini length. Frayed hem. Exposed button fly. Cotton/spandex. Made in USA of Italian materials. ALICE + OLIVIA JEANS denim skirt. Mid-rise; belt loops. Five-pocket style. Straight silhouette. Flounce hem. Mini length. Button/zip fly. Cotton/spandex. Made in USA of imported material.